I remember making a mental note when I read that Sean Murray’s “favorite thing” in No Man’s Sky were the space station windows. On two separate occasions, he even went so far as to take people directly to the same window, as if it was one of the prime features of the game. “I’m going to show you the stupidest thing,” explained Murray to IGN, “A videogame window,” quickly adding “but it’s super-cool.” It seemed like a particularly odd thing for him to say. Here was Murray, the face of a game with 18 quintillion planets, a game whose selling point was borderless exploration, seamless transitions from space to planet, and a universe of bizarre flora and fauna to discover. Here he was, pointing at a window: his favorite thing. It must have buried itself in my mind, because the first time I arrived at a space station in the vast universe of No Man’s Sky, I went straight to the window. A nebula flowered there, and the stony surface of a planet was set in relief by the sharp angle of the sun. No, not the sun, a sun. One of many, of millions—millions that, when you fly through the galaxy map of No Man’s Sky, hands at the controls, will make you shudder. You can point the camera towards the bright spot at the center of the galaxy and, holding the right stick down to accelerate, blitz through clouds of ionized dust which glow with wreaths of stars, spirals of them, for minutes at a time. And when you stop, the distance traveled will be so small relative to the scale of this universe that it will feel as if you have traveled nowhere at all. Staring out that window of my first space station, and the many that came after, I slowly understood why Murray had said that this window, and its twins, were his favorite thing. It was because, in all this vastness, in this unseated void, there was something reassuring about the simple pleasures of a limited, constricted, and directed frame. No Man’s Sky is a game all about frames. From the moment each player starts on their unique, randomly-selected planet, with a broken ship to repair and materials to gather, they are seeing things through a frame. First, it’s the frame of their avatar, who sprints across irradiated plains, jetpacks up crinkled mountain ranges, and lasers resources out of towering mineral deposits. We aren’t given this universe as our plaything, to glide through as we please, instead, we are shackled to this dysfunctional being and their fragile frame. No Man’s Sky might have been discussed as a “survival” game, but perhaps “maintenance” would be a better word for its constant onset of depleting bars. Like an astronaut on the ISS, whose daily routine is precisely configured to prevent muscle wastage, boredom, and the decay of their equipment, No Man’s Sky keeps you busy, nudging you to refill your life support, power your protective shields, refuel your mining laser, and manage your inventory. Like Murray’s window, this set of constrictions feels reassuring rather than annoying, routine rather than threatening. It, too, staves off the vertigo of the game’s apparent scale. The second frame is that of your ship. When you first leave your starting planet it is almost compulsory to swing your view around, the lines of your cockpit cropping the surface you just departed from, a moment that is genuinely breathtaking. It is from within this metal cage that you warp from system to system, each trying to outdo the last with its display of fluorescent nebulae and kitbashed freighters. Your first encounter with space pirates will be thrilling, but before long you will see many others, and you’ll dispatch the attackers with a practised and routine ease. You may even warp into a battle, fighters streaking all around, but, with time, and the accretion of upgrades and the stockpiling of resources, these too become comforting routines. Then perhaps you’ll change ship; a new cockpit shaping your view of new systems. Frames within frames will begin to emerge: alien languages whose words must be learnt from illogically-scattered totems, colonial outposts which hold upgrades and transmission detectors, drop pods that expand your inventory size. You’ll begin to recognize locations from the air, whether it’s an abandoned building or a trading post, a monolith or a ruin. You’ll know resources by their icons, barely looking at the flora that hold them, and you’ll scan alien creatures for units, without spending more than a second looking at their bizarre forms. Perhaps you’ll even generate a pattern by which you’ll exploit each planet, a repeating system, a comfortable routine, a frame that can be placed over any form, to yield the necessary results. This is the experience of playing No Man’s Sky, a series of recurring structures that overlap and intersect, a surprisingly knowable collection of repeatable actions. It’s a familiar refrain, picking up on the random encounters of Red Dead Redemption (2010), the resource gathering of Minecraft (2009), and the side quests of every “open-world” bit of design from recent years—be that The Witcher 3’s (2015) question marks or Assassin’s Creed: Black Flag’s (2013) minimap of activities. Like those games, in No Man’s Sky these elements dictate the flow of the game, and your progression within it. Ostensibly, they are the “game” at the center of No Man’s Sky, and yet conversely, they are the poorest way of describing it. As with these other games, to boil No Man’s Sky down into its simplest interactions is to seriously misrepresent it. Though the onset of progress at any cost might inspire a kind of blindness in the player, it only takes a momentary pause to understand that this layer of predictable structures, this apparent “gaminess,” is not the central experience of playing No Man’s Sky, but its frame. Like any window it shapes our view, directs our attention and gives us comfort, but to appreciate what’s in front of us, we need to look out at the landscape beyond. On the wall of my living room I have, tacked up among other images of real space exploration, a picture of a sunset on Mars. Out of almost every photograph of space and the planetary bodies of our solar system I find this one the most magnetic. It’s not unlike a sunset on Earth, albeit one that’s muted and faded, its sun perhaps subtly smaller, more distant. The saw-toothed edge of the dusty desert it shines on is inseparable from our own landscapes, the shapes so familiar as to give a sense of place; perhaps the Mojave or Sahara. The only thing that is undeniably alien is the color of its sky. Almost all of it is a dusty ochre, apart from above the white disk of the sun where it is bursting into a blotch of purest cyan blue. No matter how many times I look at that image I can’t resolve the presence of that blue. It’s a reversal of how I know a sunset to be, the blue of a summer’s sky somehow glowing inside a horizon of brown. This is the contradiction at the heart of this image: it is intimately familiar (how many sunsets have we seen in our lives? Are they not the most everyday form of wonder?) and yet powerfully strange. And by looking at it I feel both closer to that red planet and more distant from its unremarkable surface than I have ever felt. That feeling of distance and closeness, of familiarity and strangeness, is at the core of the landscapes of No Man’s Sky. Perhaps unexpectedly, my impression after 40 odd hours in its universe is of a game preoccupied by landscape. The reasons for this seem to stem from the ideas that brought Murray to make the game in the first place. I have written before about Murray’s childhood growing up in the Australian outback, on a vast plain, beneath a ceiling of stars, as well as his formative journey to the North Pole. In its final form, No Man’s Sky manages to gesture at the power of those experiences. It does this through both its characterful art direction and the sheer virtuosity of its landscape generation algorithms. It shouldn’t be a surprise to discover that Murray’s main programming role on the game was the code that dictates the formation of the game’s planetary surfaces. This code is clearly an achievement of incredible ingenuity, creating a huge variety of shapes that reveal themselves with each moment spent idly wandering among their strange and familiar forms. Though each planet possesses only a single climate, their landscapes shift and change as you journey through them. High mountains, seemingly worn down by centuries of slow erosion, slide into fractured land, marked with lush patches and volcanic scars that have scorched the earth. Open seas give way to skerries and rock pools, before solidifying into open plains. Maze-like canyons cut into towering plateaus, their passages becoming caves that twist and intersect. Into this recognizably earthlike set of spaces, alien forms are inserted, huge loops of rock or snaking pathways, razorlike spines or shattered pillars muddled with whorls of distorted strata. A sense of place pervades these locations, one that feels both profoundly relatable, and real. Onto the flowing melody of these land shapes are layered the regular drumbeats of alien flora that range from the homeliness of frozen pines to the unsettling shapes of pulsing anemones. Art director Grant Duncan and his small team of artists provide a rich patchwork of forms, which through restricted palettes meld perfectly into the lands they inhabit. This use of color gives No Man’s Sky an incredibly distinct character, and it seems hard to imagine a screenshot of its bright and bold worlds being mistaken for anything else. Red grass is offset by teal ferns, a pale green borealis glowing above, while on other worlds amber deserts are brought to life by patches of lavender scrub from which yellowing cacti grow. The result is a comprehensive examination of landscape, one that sees each rock and form not just as a prop, but as an element of a language of wonder and discovery. These elements, some quoted from experience, others improvised from an idea, are combined into vistas and pathways that are among the most powerful I have experienced in a game. That they, like the landscape that surround us on our own planet, are formed from a process—not the obsessive placement of a designer’s hand—only seems to strengthen their power, so that when you crest a rise and the totality of their artistry is laid out before you, it feels like nothing else. However, like expressions of any language, the landscapes of No Man’s Sky are structured around repetition, recurrence, and transformation. Though terms like “infinite” and “limitless” have been thrown around in relation to the game, they are both, in a quantitative and qualitative sense, incorrect. As I delved into the worlds of No Man’s Sky it became clear that what Murray and the team at Hello Games had created was not a universe without limits, but a series of limits recombined to form an unforeseeable number of variations. You cannot find any planet in No Man’s Sky, but you can find any variation of the game’s limits of what a planet might be. To put it another way, No Man’s Sky resembles the library of Jorge Luis Borges’s short story Library of Babel. A library whose books contain every variation of the 22 letters of the alphabet (as well as the additional three symbols of the comma, period, and space), this fictional construct encapsulates the structural nature of No Man’s Sky. It has, by its very nature, a limited number of variations, and yet those variations are near-infinite in number. Borges’s library contains every variation of its language, every truth and falsity, every sentence that could ever be uttered. Yet it cannot go beyond language. As Borges says in his story, “no book can be a ladder.” So, in No Man’s Sky, no rock can be a city, no creature a microchip. Its 25 letters are the textures and models Hello Games have created, the colors and shapes they have invested their world in, and the structures and systems they have allowed it to produce. This is an important distinction because it betrays the very nature of No Man’s Sky: it is defined not by disconnected variations, each one new and surprising, but by repetition, recombination, and transformation. Its landscapes are not a collection of new horizons, but somehow the same horizon, repeated, reshaped, grown and eroded in an eternally fascinating pattern. Unsurprisingly then, players will see the same repeated forms over the course of 10 or 20 planets, though often used in unexpected ways. Toxic planets, for example, have a habit of retooling the rich flora of the game’s seabeds, painting them in acrid colors and gathering them in unnerving patches, while certain trees, used in the context of a verdant forest, take on an entirely different form when they stand alone on the desolate rocks of a low-atmosphere moon. This process of recurrence deepens the sense that No Man’s Sky is an examination of landscape, a procedural exploration of its repeating forms. The creatures that populate these landscapes are built with a similar structure of repetition and recursion. They combine wings and horns, feathers and tails in idiosyncratic patterns, drifting from haunting to absurd. Occasionally they can evoke disappointment, especially when certain features seem to repeat more often than others, but even now I find myself encountering entirely new forms. It took me nearly 20 systems to find my first shark, and my quest for a whale continues even now. The search to scan and catalog these alien creatures is often one of the best ways to experience the game’s landscapes. As they show up at a huge distance as white spots on your scanner, tracking creatures is a feasible pursuit even within the huge land areas of the game’s planets. In fact, it is often the creatures of a planet that invest its landscape with a dynamic sense of place: a paradise planet of grassy islands takes on a totally different character when you discover it conceals swarms of lizard chickens that chitter among the vegetation, forcing you to jetpack from treetop to rock to avoid their attacks. And while some planets house little more than scuttling rats, some present layer after layer of discoveries. On one planet, I stalked a fish-headed creature through the mist, only to be attacked by a towering tyrannosaur. Fleeing to high ground, I found a sky filled with dolphin-like creatures, riding on unseen currents. I was adamant, after such a show, to discover every creature on this planet, and yet one eluded me for an hour. It was only on a detour to mine some gold that I spotted, on top of a mountain, the tell-tale red dots. Confused, for a moment I couldn’t understand how I could see the dots and yet not the creatures, until I zoomed in to discover a swarm of tiny floating jellyfish, no bigger than my crosshair. Many No Man’s Sky players will leave the game with stories like this, built from the dynamic interactions of a landscape and its creatures. From my experiences, I have tens of similar stories, of unexpected creatures, strange weather conditions, and a squeaking race of things that looked like bouncing rubber gloves. However, these experiences are also not guaranteed. No Man’s Sky, as a game, can feel opaque and overwhelming. For those unwilling to invest in its universe, it’s easy to glide by on its systems of progression and unit-grind, barely moving a hundred meters from their ship, and never looking beyond the next glittering deposit of gold. For those players to then turn and accuse the game of being without surprise or variety must feel galling for its creators. There is much to be said for wandering, for getting lost, for ignoring efficiency and purpose to spend a little time experiencing these glorious worlds and their inhabitants. Perhaps we might accuse Hello Games of not teaching its players to follow this path, or failing to incentivize such behavior, but to do so is missing the point. Wandering cannot, by its very nature, be a profitable act. And for those who can see beyond the material rewards of more units and resources, the reward of these vistas, revealed again and again at each hill and rise, is reward enough. We often forget that games are imaginative acts. Perhaps most of us have been playing too long to notice how we unsee pure function, and elevate fiction, coloring the gaps left between the idea and its technical implementation. As in theater, games require a certain “suspension of disbelief,” a desire to “go-along” with the rules of their worlds even if they seem unreal to us. But above and beyond this they also require imaginative investment, for us to take their often stilted worlds and invest them with the richness of life. For No Man’s Sky, this investment of imagination is the difference between life and death. At times, this is a game that seems on shaky ground, suffering from a litany of minor bugs that are perhaps a side effect of the mismatch between the size of its ambition and the size of its team. Breaks in logic occur too, whether it’s that a freighter you are defending from pirates will never fail to call the space police if you graze it with a single shot, or that sentinels will spawn from nowhere to protect ultra-rare resources but then give up moments later when you hide behind a rock. Yet none of these minor irritations obscure the surprising, distinct, and emergent experiences No Man’s Sky offers to those willing to wander. It’s there in the visual references that No Man’s Sky took as its starting point. The story goes that, when starting work on the game, Murray closed off a room in the Hello Games office for a small team. This room was papered with the covers of classic science-fiction art—1970s airbrush paintings that captured the color and richness that Murray wanted to mirror in the game. 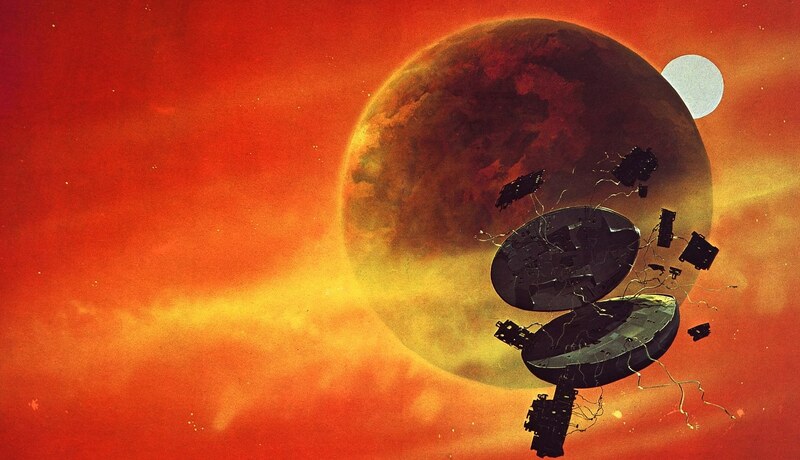 John Harris, Roger Dean, Chris Foss, the touch of these greats can all be felt in the game’s distinctive style, and yet there is also a deeper connection. These covers were made in an era of cheap sci-fi paperbacks, where designers and artists barely knew the title of a book, let alone had read it. Foss recounts getting a contract to do an Asimov cover and being told by the publisher, “Well, the last one was blue; give me a green one.” Foss and others, freed from needing to reference any specifics, found success in creating images that triggered the imaginations of readers, that pointed towards worlds outside their borders. His bulbous spaceships set against glowing landscapes were not obsessed with realism or accuracy, but with the powerful ability of images to guide our imaginations. Foss points to a postwar childhood of abandoned military hardware and steam trains as inspiration for his work, as the fuel for his imaginative leaps. In many ways, No Man’s Sky is working in the same tradition, retooling Murray’s own memories as a starting point for fantastic landscapes. The game’s innumerable worlds take on the same quality as Foss’ covers, their boldness and their beauty asking for us to let their imaginations play across their landscapes, to imagine pasts and futures for their inhabitants. Perhaps one of the most powerful tools in facilitating these flights of imagination is No Man’s Sky’s sound and music. Sound director Paul Weir has achieved something remarkable in his contribution to No Man’s Sky, guiding us to fill in those imaginative gaps, to make its world feel real. The drumming of rain on a ship cockpit, the echoes of water splashing in a cavern, the howl of a starship streaking past. His work gives depth and richness to the game’s startling images, and when combined with the lonely, minor tones of 65daysofstatic’s soundtrack, this constant scoring of the game’s landscapes unearths their aesthetic and emotional power. It speaks to the game’s careful combination of the strange and familiar that Weir built this world from the most everyday of objects, as he put it himself: “lots of leaves, microwave, washing up bottle, numerous doors, camera tripod, 3D printer, coffee machines, paper shredder and more.” It’s a pleasing idea—that No Man’s Sky’s sound design is a flight of imagination in itself, a plumbing of sonic possibilities of our everyday lives. This willingness to invest, to imagine, is something that feels built into the very fabric of No Man’s Sky. To a cynical observer, for example, the monoliths dotted across each planet seem to offer the same thing, a simple logic puzzle and then a material reward and a new alien word. Yet, if you pay attention to their text, these structures contain a series of bizarre, fascinating, and symbolic acts. Melting stone, floating body parts, ritual sacrifices, transcendental visions; the stories they present are wonderfully odd, each being a philosophical problem related to the identity of their race, whether it is the logical Korvax or the warlike Vy’keen. Ruins present similar ideas, fragments of history that resemble Destiny: The Taken King’s (2015) ornately written Books of Sorrow. Even encounters with lone aliens brim with characterful prose, whether it involves accepting a marriage proposal from a Vy’keen, or simply bargaining with a squawking Gek. And perhaps the most distinct are the psychedelic, flesh-filled nightmare visions of a long-dead traveller, uncovered in the infected remains of abandoned buildings. That these stories are told almost entirely through text betrays their inspiration; the golden era of science fiction. I couldn’t help but think of this passage while playing No Man’s Sky. Like Dune, it sees science fiction as a form unshackled from the technical, one driven towards the imaginative. And in its narrative frame—one that includes the ponderings of adventurers Nada and Polo and the all-powerful computation of the Atlas—it drives towards a future of space travel as a kind of transcendence, a stretching out of experience to include every variation and recursion, to find every life and landscape. In both Dune and No Man’s Sky there is something innately human in this. After all, who else would aspire to transcend than a limited being? No Man’s Sky is not there to facilitate our transcendence, instead, it is there to help us imagine it. The experiences it offers feel like a near limitless fuel for new stories, tales of vast landscapes, of adventures far from that which is known. Catalyzed by an interest in obscurity that sees lore go unrecorded, details hidden, mysteries maintained, it exerts a powerful grip, absorbing hour after hour into its promising worlds. There is another phrase from Dune that came to mind when I was playing No Man’s Sky, “a theater of processes.” Paul Atreides uses it to describe himself, but I can’t think of a better way to describe No Man’s Sky. Processes of discovery. Processes of wonder. And in its landscapes, processes of erosion, time, meaning, light, and growth. It is a quirk that landscape, perhaps one of the most powerful affective devices in fictional worlds, is so undermined in our discussion of games. The term “walking simulator” as used to refer to games like Proteus (2013) and Dear Esther (2012), games which draw their power from their landscapes, is an insult, a slur on the idea that one of most essential experiences of humanity might bring meaning, affect, and emotion. No Man’s Sky is not a “walking simulator,” but it is a game where wandering, exploring, and experiencing landscapes is its most powerful aspect. This relationship to landscape is not an abstract quality—it stems from the lived experience of Murray and others and from their need to share the fantasies that grow within those experiences. Many see games as the chance to fulfill our dreams as players, to achieve our impossible desires. No Man’s Sky, despite appearances, refuses to bow this, becoming instead the actualization of the dreams of its creators, their well-cultivated obsessions. It is wilfully obscure, yet generously rich. It reminds me, in the procedural openness of its landscapes, of my own experiences wandering in the islands of Scotland, the Lake District of England, the Swiss Alps, and the Romanian Carpathians. Each left with me a memory, a taste, a cloud of emotions and atmospheres. No Man’s Sky has left me with similar traces, planets I will never return to, sights missed and the ghost presence of that which remained unseen, in those moments that I trudged back to my ship, my time finally up. And as I became more familiar with its systems, as I began to master the repeating frames of its world, they began to fall away. Mastery brought with it an openness that was dizzying in its freedom. I had a ship I liked, enough units to get by, and an inventory that served my purpose. Unshackled from the grind, I suddenly realized I could wander. This recursive world was mine to study, to understand, to find meaning in. There it was, spread out in front of me, a field of blinking lights: the very image of promise itself. Because there is something after the routines, after the frames layer upon the frames, when you can only understand the universe as a series of codified transactions. There is something quietly waiting to emerge, as you switch off your waypoint, direct your ship away from the center of the universe and warp to a star—any star. You start to see that there are classes of star, there are variations of landscape you have never seen, there are surprises big and small as well as sights both familiar and unknown. As you land on the highest point of the highest peak, or among the clustered islands of the shore, or at any point that pleases you, you see the landscape once again, but with new eyes, eyes that aren’t looking for anything but to be there, in another place, for a short while. And perhaps to come back with some stories to tell.